SAVE when you bundle–our BEST values!! NOTE: Total Tester practice tests available for Windows OS only. CySA+ Certification Video Training (online), starring Brent Chapman. Seven hours of training, over 50 episodes. Filmed in an episodic format designed to optimize your learning experience, the Brent Chapman CySA+ video will fascinate and engage you as you learn the concepts covered in the CompTIA CySA+ certification exam CS0-001. Brent is an information security engineer with over 15 years of experience in information technology and cyber security. As a researcher at the Army Cyber Institute (ACI), Brent explored emerging information security and cyber warfare issues with a focus on field-expedient solutions and countermeasures. He holds a BS from West Point and an MS from Carnegie Mellon University. The Total Tester Online CySA+ Practice Tests simulate the CompTIA CySA+ exam experience and test your technical knowledge on key exam objectives. 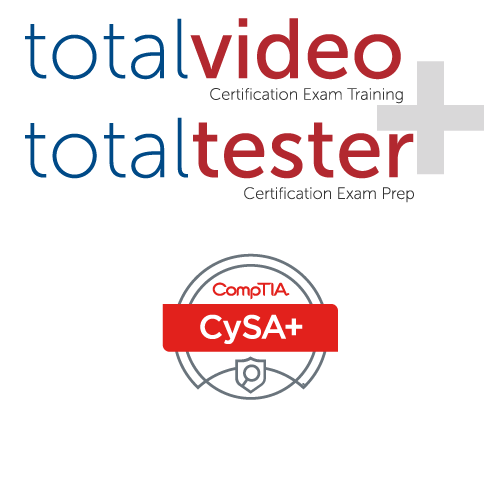 Use our Total Tester CySA+ practice tests to be SURE you are ready for the CompTIA CySA+ certification exam. Questions are drawn from a pool of over 150 questions.